Although Armstrong & Legge’s patent to produce copper halfpennies for use in Ireland was confirmed by James II, these coins were actually minted by Sir John Knox, the Lord Mayor of Dublin. On the 17th June 1685, they transferred this patent by deed of appointment to Sir John Knox for the remainder of the time unexpired, subject to the same terms and conditions as the original patent of 1680. Year Poor Good Fine VF EF Unc. The last year of issue was 1688 when James II abdicated and fled to France – although he arrived in Ireland at the end of the year (March 1688/89) with the aim of raising an army and regaining his crown by force. Secondly, he introduced a new promissory (fiat) currency, but that story (James II’s gunmoney) is for another blog post ! When James II began to mint his gunmoney in Dublin, he used the two coining presses used by Sir John Knox to mint his regal halfpennies in Dublin’s Capel Street. This equipment was seized from Colonel Roger Moore, who held a patent for coining copper halfpennies (originally issued to Sir John Knox) – it being passed to him via a legacy from Sir John Knox. 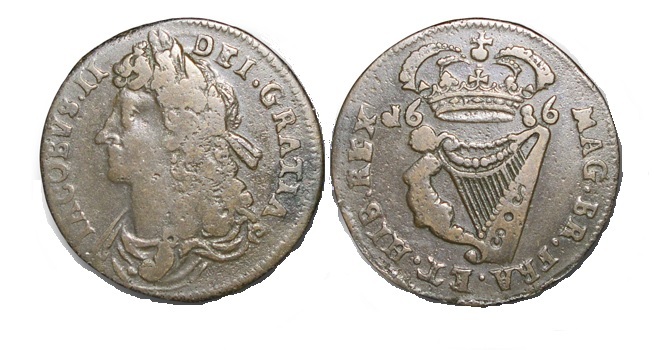 These were the last regal coins to be minted in Ireland – all others up to and including the pre-decimal and decimal coinage of Ireland were minted by the Royal Mint in London. Who was Sir John Knox ? Sir John Knox was the son of William Knox, esq. of Lifford, Co Donegal. John Knox settled in Dublin some time in the 1650’s – he was obviously quite successful for he attained the position of Sheriff of Dublin (along with Walter Motley) in 1675 and later served as Lord Mayor of Dublin for the term 1685–86. During his period of office as Mayor, he was knighted in Christchurch Cathedral by the Earl of Clarendon, then Lord Lieutenant of Ireland on 6th February 1685. He then married Hannah, sister of Colonel Roger Moore of Johnstown, Co Kildare in 1686 but died shortly afterwards (3rd November, 1687) and was buried in the chancel of St Audeon’s Church. His brother, William, who died in 1707, is buried nearby. Upon his death without an heir, Sir John’s patent to produce copper halfpennies for Ireland for a period of 21 years was passed on to his brother-in-law, Colonel Roger Moore. Who was Colonel Roger Moore ? Colonel Roger Moore (or, O’Moore) of Johnstown, Co Kildare, was bequeathed Sir John Knox’es mint at Capel Street, Dublin and the two coining presses therein. Amongst those who fought with Rory O’More in his subsequent war against Cromwell were his cousins Roger and Lewis, sons of Calaogh O’Moore by his wife Margaret Scurlock. Described as “the Hellhound of Ballyna” by one plaintiff in the Depositions of 1641 and 1642, it seems strange that Roger would have survived the Cromwellian confiscations and transportations, but he went on to marry Jane Barnewall, daughter of the Catholic hero Sir Patrick Barnewall of Turvey.